Property Size 2,717 sq. ft. 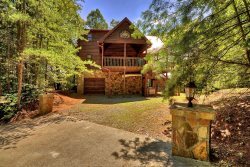 This spacious cabin sits on a private lot and has beautiful, year-round mountain views. Enjoy the outdoor hot tub, fire pit or take in the breathtaking views in the separate, private jacuzzi room in the master loft suite. The staff was very friendly! They accommodated us well with our stay and were very responsive. I called several asking questions about the cabin, etc. and each time, they took the time to talk with me and explain things and were very helpful! We will definitely be back! This property was absolutely breathtaking. It had everything we needed and more. I wasn't worried about safety or my kids safety. There were people around but not so close that it was a bother. There was something for everyone to do from enjoying the view of the mountains, to getting in the hot tub, to enjoying the game room to who knows what!! We were close enough to visit Helen, GA and Ellijay and even took a day trip to Chattanooga, TN! It was perfect!!! Staff was polite and helpful. Awesome experience,enjoyed by all. 3 year old to 67 year old.